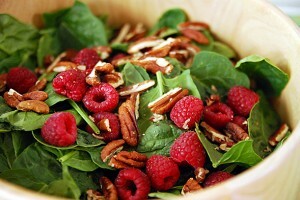 Category Archives: Raspberry spinach pecan salad. A very healthy as well as ambrosial salad to serve along with my Bacon Spinach quiche or other savory dinner menus. 1 large package of fresh and cleaned spinach, 1-2 containers of fresh, washed red raspberries, (you can also substitute with fresh sliced strawberries,) 1-2 small packages of pecan halves, (depending on how large your salad is,) ground black pepper and salt to taste, and your savory dressing. PHOTOGRAPHS If you place your computer mouse upon any of the pictures or graphics in this blog, it will display to you where the picture originated from.